The ancient city of York is currently a conglomeration of Roman, Viking, Norman, medieval, and modern architecture, such that a Starbucks mingles quite easily with the centuries old York Minster and medieval Shambles. This is a city with a turbulent history of invasion and integration of new cultures - it's possible to walk around for many hours just enjoying the varying images each era has left on the city. 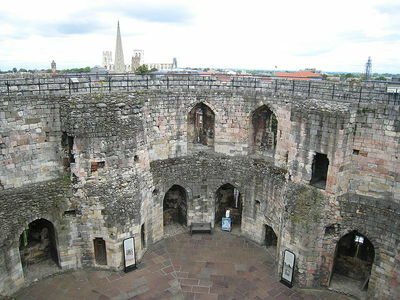 Clearly, there are many iconic places to visit on a trip to York, but one unmissable place is Clifford's Tower. Visible from a long distance away at the very top of a perfectly round hill, this tower, more like a castle, immediately provokes curiosity. 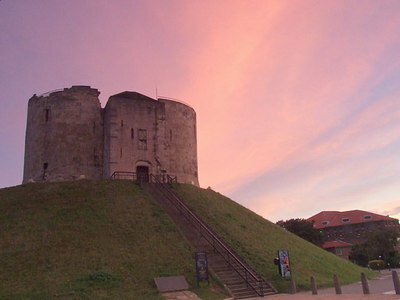 Clifford's Tower. Photo by Erin Connelly. No one knows why the tower is called Clifford's Tower. Though, it may refer to a medieval prisoner who was executed in the grounds (Roger de Clifford). The mound originally had a timber fortress at the top, which was constructed by William the Conqueror in the eleventh century, as part of a wide range of castles, towers, and fortifications built across England as a demonstration of his conquest of the island. This original wood structure was burned during the massacre of 1190, a tragic and terrible event which still haunts the current building. Inside the tower. Public Domain. After climbing the several stone steps to the top of the hill, it's unfortunate to learn that the tower's foremost claim to fame is a medieval massacre of York's Jewish citizens. In 1190, a violent mob went after the Jewish population, who took refuge inside the tower. Within the fortress, many of the people took their own lives, others died in the burning building, while those who surrendered to the mob were murdered. Altogether around 150 people perished in the assault. Tower during a rainstorm. Photo by Erin Connelly. The tower has since been rebuilt and subsequently destroyed by weather, neglect, pillage, and war many times over through the centuries. In recent years, a proposal to demolish the tower in favour of a new shopping centre has been put forward, but this plan is hotly opposed by many members of the public who believe the tower should be left as a memorial to the massacre and a reminder of York's tumultuous heritage. Tours of the tower are available for a small entrance fee. Walking up the hill and around the edifice is free and provides some lovely panoramic views of York. Of course, one doesn't travel all the way from London to the north of England just to see a fortress on a hill, but it is certainly worth adding to your list of attractions on your next weekend away in York. Dawn at the tower. Photo by Ian Dalgliesh. I haven't been to York for years, but made a point of visiting Clifford's Tower. In addition to a slight touch of vertigo, I could almost sense the ghosts of the past calling to me.